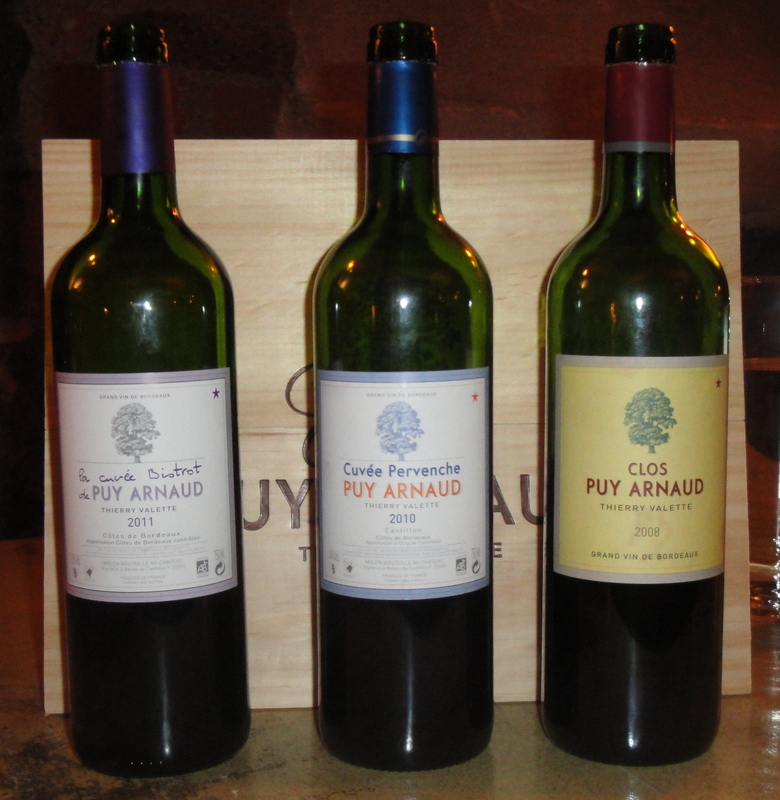 I recently tasted two wines from Clos Puy Arnaud at a (French-)Swedish importer by the name of Caviste, and I realised that I never translated last year’s tasting of three wines. Clos Puy Arnaud is located in the Castillon area on the right bank of the Bordeaux region, to the east of Saint-Émilion. This property is located within the red wine appellation of Castillon Côtes de Bordeaux, formerly called Côtes de Castillon. The man behind Puy Arnaud is called Thierry Valette, and runs his estate biodynamically and in the direction of so-called “natural wine”. The vineyards consist of 75% Merlot, 20% Cabernet Franc, and 5% Cabernet Sauvignon. Apparently there is an ambition to increase the proportion of Cabernet Franc – in my opinion an underappreciated variety that imparts a lot of the classical Bordeaux character to the right bank wines – and to introduce a small amount of Petit Verdot in the vineyards. The three wines tasted in October 2012. 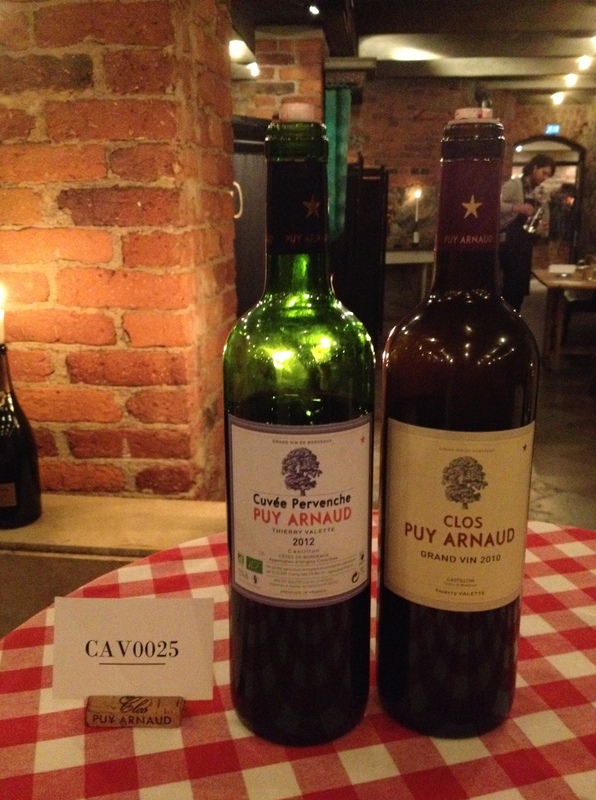 The first wine is called Clos Puy Arnaud and the second wine cuvée Pervenche. Since the 2009 vintage, there is also a wine called La Cuvée Bistrot that is intended to be a Beaujolais-styled wine intended for drinking when young, and this a wine that may deviate from the style commonly found in Bordeaux. It is therefore sold under the wider Côtes de Bordeaux appellation, without the addition of Castillon. As mentioned above, the tasting notes are from two different tastings: October 2012 and December 2013. October 2012: Nose with ripe cherries, blackcurrants, raspberries, some cherry-filled pralines and chocolate. The attack shows sweetness of fruit, good concentration of fruit on the palate, cherries, rather noticeable acidity, medium tannins. Young but approachable, 86 p.
Not quite Beaujolais styled if Beaujolais Noveau would be the point of comparison, but rather a serious Beaujolais Cru and a certain amount of imagination. The wine is however produced in a fresh and accessible style for being a Bordeaux with this good concentration of fruit. October 2012: Nose with rather ripe dark berries, ripe plums, some spice, well integrated oak. Classical young Bordeaux nose. Palate with rather much sweetness of fruit in the attack, cherries, red currants, good acidity, medium(+) tannins, slightly tannic aftertaste with noticeable acidity/tartness. Young, 87+ p.
Rather typical for a young right bank Bordeaux, but with its alcoholic impression in very good check despite the 14% indicated on the label. Castillon Côtes de Bordeaux, grape varieties: 80% Merlot and 20% Cabernet Franc. December 2013: Nose with ripe dark cherries, dark plums, spice, some herbs, oak, and some vanilla. Palate with ripe dark cherries, other dark berries, pronounced acidity and tartness, well embedded medium tannins. Young, but approchable now, 87(+) p.
2012 seems to show slightly darker notes than 2010, and does perhaps come across as a little more accessible already in this young stafe. I consider them to be at about the same level, which is a good sign for the 2012 vintage in general, since I haven’t seen that many red 2012s yet. Despite the fact that I noted rather similar aromas as I found in the 2010 (when I wrote “classical young Bordeaux nose”) my first impression of the nose of the 2012 was actually that it was surprisingly Syrah-like! October 2012: Nose with blackcurrants, dark plums, well integrated oak, spice, emerging maturity. Palate with ripe cherries, good concentration, noticeable tartness, medium(+) tannins, some tar. A bit more firm and at this stage less expressive than the 2010 second wine. Was apparently more accessible earlier during the tasting (I arrived toward the end), so my thought that it may had closed down wouldn’t be really consistent with that. Difficult to score, so I withhold the number. Castillon Côtes de Bordeaux, grape varieties: 65% Merlot, 30% Cabernet Franc, and 5% Cabernet Sauvignon. December 2013: Nose with ripe blackcurrants, some blackberries and dark plums, notes of “sun-ripened” berries, some tar, a hint of barnyard aromas, oak med some vanilla. The palate is medium bodied+, with ripe blackcurrants and dark plums, good concentration of fruit, noticeable acidity with an impression of tart berries, medium(+) tannins that are well embedded mid-palate and emerge more in the aftertaste. The aftertaste also shows ripe berries and some oak. Young, rather accessible already due to its tart and fresh palate, but it would be good to give it time in the cellar to better integrate the oak note, 89(+) p.
This wine shows rather typical 2010 character with a combination of good ripeness, fresh acidity and clean notes. Last year, I considered the 2008 to be somewhat closed-down and difficult to score, and wondered if it had already gone hiding. This was not the case with the 2010; this wine was an exclamation sign, pure and simple. A common characteristic for all the wines is that they show quite good and fresh acidity, that lightens the tannic impression of the young wines. Although some of them show a bit of sweet fruit, they also avoid coming across as too jammy, which can be an issue with Merlot-dominated wines, at least in some vintages. Although I’d recommend to cellar the first wine, the average style from this producer is a wine that has been styled for early consumption without compromising the quality, which is a very interesting combination. They may not be entirely classical Bordeaux wines for those who take their frame of reference from the Cabernet Sauvignon-dominated wines of the left bank, but they definitely are quite good wines! Swedish versions here (December 2013 tasting) and here (October 2012 tasting). This entry was posted in Bordeaux, Merlot. Bookmark the permalink.